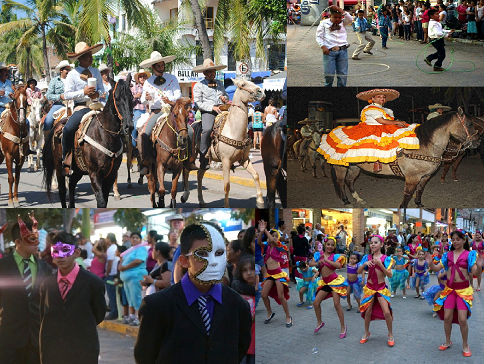 Riviera Nayarit Mexico Blog: The 2014 La Peñita Tropical Charro Carnival is Ready To Go! After nearly 40 years of partying this Carnival seeks to keep our traditions alive while offering an enticing attraction for residents and both national and international visitors. La Peñita de Jaltemba is ending the month of February on a high note and starting March off with a bang with its 2014 La Peñita Tropical Charro Carnival, which starts on the last day of the month and runs through the 4th of March. This Carnival is quite special thanks to its unique combination of attractions—this coastal village is known for its love of the traditional charrería, or Mexican rodeo, and the way it truly enjoys and appreciates beauty of its tropical surroundings. With almost 40 years of history, the carnival’s name stems from a group of charros (Mexican cowboys) in the mid-70s who began what is today quite a ritual. According to Rossana Araujo, president of the Compostela Hotel and Motel Association, this organization is the main sponsor of this exciting event. The Association is backed in turn by several sponsors and the Citizen’s Action Committee. On February 28th there will be an inauguration dance and a ribbon cutting next to the Emiliano Zapata monument; there are different activities every day to keep the entire family entertained. Thanks to its lengthy history the carnival has attracted many national and foreign tourists throughout its five days, as well as residents who live in the Riviera Nayarit six months out of the year. Public and private schools and establishments, social businesses and other sectors also participate and back the event, which starts off with a parade and ends with another, with plenty of cultural, sports and artistic events in between.